Eye Care There are 2 products. Highly effective at treating the common eye infections in cattle. 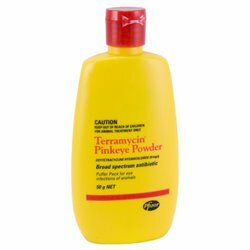 Terramycin Pink Eye Powder is a broad spectrum antibiotic for eye infections of animals. Terramycin Pink Eye Powder contains Oxytetracycline Hydrochloride 20mg/g in a non-irritant carrier.